We’d love your help. Let us know what’s wrong with this preview of Things Remembered by Georgia Bockoven. A fabulous repackaging of this deeply emotional novel from the bestselling author of Beach House and Another Summer, Georgia Bockoven’s Things Remembered is a heartrending tale of family and the healing power of love. This intensely moving story follows a young woman’s difficult homecoming to Northern California where, despite painful memories of her past, she must make peace with her ailing grandmother before it’s too late. An enduring masterwork of women’s fiction, Things Remembered is Georgia Bockoven at her very best. They say you can’t go home again—but Bockoven fans will find this heartfelt return to be well worth the journey, as will readers of Elin Hilderbrand, Juliette Fay, and Karen White. To ask other readers questions about Things Remembered, please sign up. Raising three granddaughters and learning that they never changed as adults was what Anna found out when she needed her granddaughters to take care of her. Karla was the granddaughter who always made sure things were settled and in order, and Karla was the most unlikely to help but the one who did come to help Anna. Returning to her home town and sleeping in her childhood bed brought good and bad memories back for Karla. The bad ones included not really getting along with her grandmother, but th Raising three granddaughters and learning that they never changed as adults was what Anna found out when she needed her granddaughters to take care of her. Karla was the granddaughter who always made sure things were settled and in order, and Karla was the most unlikely to help but the one who did come to help Anna. Returning to her home town and sleeping in her childhood bed brought good and bad memories back for Karla. The bad ones included not really getting along with her grandmother, but they both found things out after all these years that had been mistakenly assumed and that had them holding unnecessary grudges. As you are reading, you will think of your childhood and your mother and most likely have tears as I did. This book will make you think about your life and your relationships with your parents, your friends, your siblings, and any other people in your life. The details and character descriptions are vivid. The main focus of the book was on Karla and Anna and how they re-discover each other as well as the re-discovering of themselves and things about other family members they never knew. The love they never had for each other as Anna raised Karla came to the surface with happiness but also with regret that all those years had been wasted. I enjoyed the family connections and how nicely the story flowed along with situations that will make you think about your family relationships. The book is perfect for this time of year with Thanksgiving around the corner. It is a book about being thankful for who we are and who helped us get where we are. Whether we realize it or not, we "are" our mother, father, grandmother, or grandfather and can't change that. This book is a warm, cozy read about reliving family moments, making new family moments, starting anew with your life, and definitely is all the things your parents told you would be coming true some day….all the good things that is. This quote will make you want to find out why it was so significant to the story: “Have a good life, sweetheart.” Find out who and why. Don’t miss this book, and definitely don't miss the recipes included in the back of the book. This book started out extremely slow for me. It was extremely repetitive and overly sappy. Anna and Karla appeared to have the same, heavy conversation every other paragraph. I didn’t particularly care for Karla, I thought she was such a pushover concerning her sister Grace. By the way, I wanted to punch that girl in the face. And no, I don’t think she redeemed herself in the end. Honestly, I would have been much more interested in reading Bill and Heather’s story. They seemed like a loving couple This book started out extremely slow for me. It was extremely repetitive and overly sappy. Anna and Karla appeared to have the same, heavy conversation every other paragraph. I didn’t particularly care for Karla, I thought she was such a pushover concerning her sister Grace. Honestly, I would have been much more interested in reading Bill and Heather’s story. They seemed like a loving couple and their story interested me. Karla’s did not. Towards the end, I did warm up to the story. I liked Karla and Mark together, though I find it unrealistic that they loved each other immediately. Overall, it was too sappy for me….which is unusual because I can usually handle sap like a boss. In fact, I love sap. But even this was just too much. I received this book through a first-reads giveaway. Things Remembered reads like a sappy made for tv movie. The characters in this book are one dimensional, and I couldn't relate to any of them or their experiences. Karla seems to be a multitude of contradictions: she's bitter and filled with anger yet bears no hard feelings toward the ex-husband who cheated on her and she's a seriously devoted business woman who spends no time actually working. The author includes a few recipes at the end of t I received this book through a first-reads giveaway. Seemed like it was going to be a really good book, but halfway through, it was a struggle to keep reading. I liked the story but it was very alow moving at the start. I wish i had realized before I was done that this was reprint of a book from 1998. I didn't understand why no one had cell phones etc until after I was finished. If I had known prior, it probably would have cleared up some of what I thought were inconsistencies in the plot. I liked the book. I didn't love the book. It was slow in the beginning and then almost too much happened at once and there was no closure at the end. Really nice story of grandmother and grown grand-daughters all with special memories of growing up with their grandmother after the sudden deaths of their parents. Do we ever remember things they actually happen? Nice read. Definitely chick lit. I liked the idea for the story. I liked the ideas for the characters. But it was a slog. Uneven characterization and pacing, so much telling instead of showing (11th grade English), and chock-full of treacle. I like sentimental when it's done well, but this book was cheesy when it should have been charming. Some good moments -- enough to keep me reading and hoping for more -- but ultimately disappointing and forgettable. Every family has one person who can be depended upon to take care of things, no matter the personal cost. Karla Esterbrook is getting tired of being that person. Nevertheless, she arranges to have someone run her coffee shop for a month and makes the drive to northern California to help Grandma Anna get her estate in order. Anna knows she does not have much time left to make things right with her eldest granddaughter. Anna loves Karla’s younger sisters, Heather and Grace, but the impact of the de Every family has one person who can be depended upon to take care of things, no matter the personal cost. Karla Esterbrook is getting tired of being that person. Nevertheless, she arranges to have someone run her coffee shop for a month and makes the drive to northern California to help Grandma Anna get her estate in order. Anna knows she does not have much time left to make things right with her eldest granddaughter. Anna loves Karla’s younger sisters, Heather and Grace, but the impact of the death of the girls’ parents has been much different for them than for Karla. With time running out for Anna’s weakened heart, it is vital to help Karla come to terms with the past. Karla never expects to feel herself softening toward Anna. Yet, the more the two women connect, the more she realizes that there is a bond between them. With Anna’s help, Karla will lay past hurts to rest. As the healing begins, Karla will find the courage to open her heart to love not only her family, but also an incredible man she never dreams existed. Ms. Bockoven touches so sweetly on the shared emotions and experiences that tie three sisters to the grandmother that raised them. I believe my only complaint about this winsome story is that I will never in a million years find real people who can express themselves as beautifully as Ms. Bockoven’s characters do on paper. Readers will enjoy this unforgettable tale of love, sacrifice and the miscommunications that drive us crazy in our own lives. Karla Esterbrook finds that in order to move forward on must face the past. Her past consists of being the oldest of three girls that suddenly lost their parents and were shipped between family until finally going to their maternal grandmother Anna, of which she has a very complicated relationship with, she has an ex husband that has left her in debt and a store she always dreamt of owning. Karla finds herself being in charge of preparing the estate with Anna and start settling all the affairs. Karla Esterbrook finds that in order to move forward on must face the past. Her past consists of being the oldest of three girls that suddenly lost their parents and were shipped between family until finally going to their maternal grandmother Anna, of which she has a very complicated relationship with, she has an ex husband that has left her in debt and a store she always dreamt of owning. Karla finds herself being in charge of preparing the estate with Anna and start settling all the affairs. Misunderstandings, miscommunications, and the walls that were built long ago come up, but soon as Karla opens her heart to listen she is able to open her heart to love - hopefully it isn't too late to make up for all the years wasted. I loved this book. The complicated story of female relationships, the family ties that bind us, the gift of love through the generations, traditions, the gift of forgiveness - especially for yourself. So many themes and this is the book that is PERFECT to share with your sister, mother, grandmother, cousin. A great beach read, good for discussion, but mainly for that feel good feeling for the women in your life and how strong their importance lingers. Have you ever finished a book and thought whatever I read next will never be as good? That is what when I finished Things Remembered. Things Remembered sucked me in from page one and I could not put it down. Karla's grandmother, Anna, raised Karla and her sisters after their parents death. Karla goes back home to help Anna get her affairs in order because she is dying. Returning home brought back good and bad memories for Karla. Karla and Anna re-discover themselves and find love that they never Have you ever finished a book and thought whatever I read next will never be as good? That is what when I finished Things Remembered. This is my February book off Kristin's of Kritters Ramblings bookshelf. If you haven't read Georgia Bockoven before this would be a great place to start. This story is very heartwarming. When you start reading you will immediately have a connection with the characters. This story reminds me to enjoy and cherish my time with my girls. Having traditions and making memories to pass down to the next generation is important. I did have a few tears while reading since I have lost my mom. This story is This is my February book off Kristin's of Kritters Ramblings bookshelf. This story reminds me to enjoy and cherish my time with my girls. Having traditions and making memories to pass down to the next generation is important. I did have a few tears while reading since I have lost my mom. This story is not morbid or even sad - it is more hopeful. I will be reading more Georgia Bockoven's books. Karla Esterbrook is dreading the return to her childhood home. She's not going because she wants to, she's going because she has to. Her grandmother Anna is dying of congestive heart failure. Karla isn't going home to profess her love for her grandmother. She's going to help Anna get her will in order. There's no time to deal with feelings, this visit is purely for practical reasons. But this visit will be more than they bargained for. Oh, I'm such a sucker for family dramas. I was instantly draw Karla Esterbrook is dreading the return to her childhood home. She's not going because she wants to, she's going because she has to. Her grandmother Anna is dying of congestive heart failure. Karla isn't going home to profess her love for her grandmother. She's going to help Anna get her will in order. There's no time to deal with feelings, this visit is purely for practical reasons. But this visit will be more than they bargained for. Oh, I'm such a sucker for family dramas. I was instantly drawn to Things Remembered by Georgia Bockoven. Loved this book about 3 sisters and their grandmother that raised them after their parents were killed. A story of things remembered (memories) between the sisters and their grandmother and of the eldest sister who was estranged from her grandmother but in reconnecting realizes truths about herself and they remember memories about a mother/daughter. A story of acceptance and of love both former loves, new love, reconnected love and love that will span future gnerations. I loved this book and did no Loved this book about 3 sisters and their grandmother that raised them after their parents were killed. Was this book sappy, similar to a lifetime movie? Yes. Do I happen to love lifetime movies? Yes. Was this book extremely predictable? For sure. Three sisters are raised by the grandmother after their parents die. Years later Karla returns home to help settle her grandmother’s affairs as she is dying. But there are problems not only with her grandmother but with her sister. This is a story of forgiving and forgetting the past and the imporatnace of family. If you enjoy sappy Lifetime or Hallmark movies, then this is the story for you. Beautifully written; but easily forgettable. The characters are okay, but sometimes irritating and one-di Three sisters are raised by the grandmother after their parents die. Years later Karla returns home to help settle her grandmother’s affairs as she is dying. But there are problems not only with her grandmother but with her sister. This is a story of forgiving and forgetting the past and the imporatnace of family. A fast and engaging read and I could easily relate to the family dynamics of the sisters and the concerns of having an aging parent or grandparent. It is a sweet story and a perfect fall/winter read as it is set over late October and flows into Christmas and beyond. 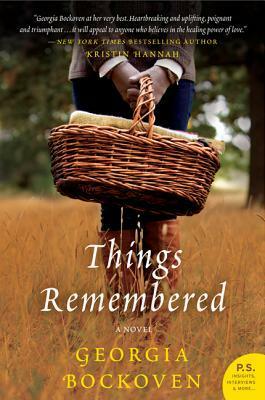 Things Remembered is good pick for anyone who enjoys books about family and relationships. I got this book in a First Reads Giveaway. It took me a little while to read this book because sometimes in was rather repetitive and predictable. But it was also overall lovely. I've lost many loved ones in my life starting at a very young age. I learned first hand the different ways people grieve and attempt to understand their loss. The characters in this book were amiable but sometimes contradictory. The recipes at the end of the book were a great surprise! Thank you! Don't you hate it when a book's plot seems to resonate with you and you begin, in earnest, to be taken in only to have a huge disappointment with it as it progresses? Well, that is this. The writing is fine, not great but certainly of an accomplished writer. But the plot line is predictable (and I am the last to guess, so it must be elementary, and yet I thought there would be surprises or twists I hadn't anticipated but no. Not there. A fairly quick read but not so enthralling. What a wonderful story of family, love, memories, tradition. Karla and her grandmother have never had a good relationship, but as they come together, the relationship changes over time in subtle ways that tug at your heart. I am so glad I read this story because it rests on so many things I value as important and meaningful ... stories retold, memories, moments with family, traditions, strength of character, steadfastness and the power of love. and the inability of some family members to communicate with each other. At the end of the book, the author had several recipes...I'm going to try the mincemeat fruit cake! Three sisters lose their parents at a young age and after being shuttled around they end up at their maternal grandmother's house to be raised. Each react to this trying time in different ways and it was so interesting to read how one moment can affect each of the three sisters. I could not finish this book. It has been over 6 months and I STILL can't bring myself to finish it. If a book even has a wiff of romance in it I am usually all over it. This I just didn't get into. I think it was because I didn't like the main character or her spoiled sister. Anyhoo this book was not for me. got to page 237 and couldn't do it any more. I loved this book! I cried, laughed, got mad, and wished there was more when I reached the end. It did start a little slow but once it picked up I really enjoyed it and could relate to some of the relationships. Georgia was a Army child, who after a successful career as a freelance photo journalist before she turned to fiction writing. Published since 1983, she is an award-winning author whose books have sold more than four million copies worldwide. Her romance novel, A Marriage of Convenience, became a CBS movie in October of 1998 starring Jane Seymour and James Brolin. Married wich John Bockoven, she is Georgia was a Army child, who after a successful career as a freelance photo journalist before she turned to fiction writing. Published since 1983, she is an award-winning author whose books have sold more than four million copies worldwide. Her romance novel, A Marriage of Convenience, became a CBS movie in October of 1998 starring Jane Seymour and James Brolin.